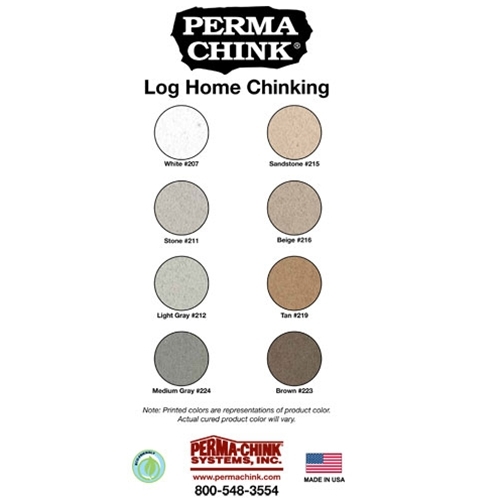 Perma-Chink® chinking is a stretchable log home chinking. Perma-Chink is a flexible, textured log home chinking that seals the open gaps between logs to eliminate heat loss and air infiltration. Even though it looks and feels like traditional mortar, it's not. Perma-Chink is a pure acrylic that adheres to logs and stretches to maintain a tight seal by following log movement. Application can be done by a homeowner or a professional contractor. We stock a full line of application accessories or can refer a professional applicator in your area. You need pails of Perma-Chink. 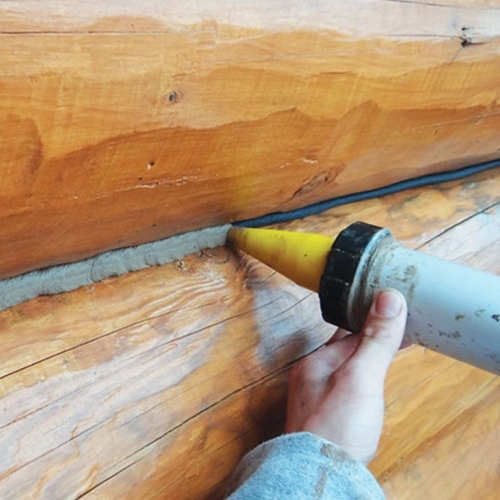 Fill log gaps with appropriate sized backer rod before applying sealant. Apply Perma-Chink sealant over backer rod. Mist with water to make tooling sealant easy and smooth. 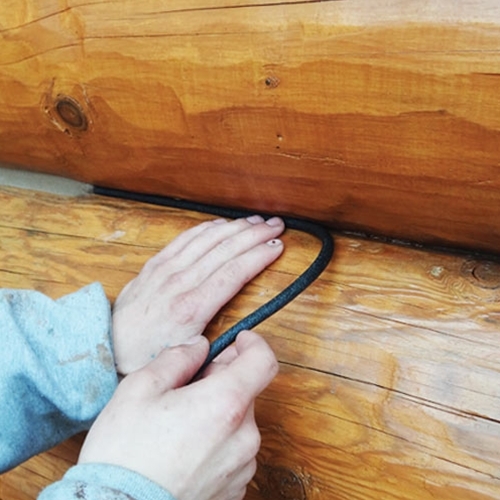 With light pressure, slide flat-bladed tool along sealant to smooth and ensure adhesion to logs. S. Moore (4/9/2019) - "We used Perma-Chink to chink a new log home project built the old fashion way, hand crafted. We used grip strip in the gaps and then chink in medium gray on top and it was the perfect application for this job. The chinking finished perfectly. I would certainly use this product again." Linda L (3/24/2019) - "I have used so many Perma-Chink products (chinking, Chink Paint, Check Mate 2, Woodsman, etc.) and all have exceeded expectations. Best of all is Perma-Chink's customer service!" Andy M (11/08/2018) - "There wasn’t much of a learning curve with Perma-Chink. I was able to apply it easily enough. I just put some on our cabin last week and it matches our 30-year-old chinking very well. The parts that I applied last year have dried solid. This is a great product. It doesn’t really have an odor. Next summer I am doing part of the interior." Brian F (11/05/2018) - "I'm a log homeowner who stands behind Perma-Chink's chinking, Lifeline stains, Advance topcoat, Log End Seal, Energy Seal, and every other product offered. My logs are hand-hewned with the original style chinking so we used I think 25 pails of chinking and none of it has failed. The chinking is tops, stain is very durable and easy to apply. The entire staff at Perma-Chink Systems always goes the extra mile when I call and ask questions or for advice. Perma-Chink has the best customer service of any company period in all types of industries I interact with. Unbelievable!!" Greg L (09/18/2018) - "What a cool product! I was very nervous to aplly it by myself and I had a contractor lined up to give me a bid. Brad from Redmond store gave me great instructions and I was able to chink my entire home! Easy product, no smell, no grease, no muss, no fuss." Thomas J (07/25/2018) - "Perma-Chink was easy to apply and looks really good. Very elastic, no breakage. Thank you for making a great product." James F (05/30/2018) - "Excellent products, easy to use, great tutorials, and extremely fast shipping!!! 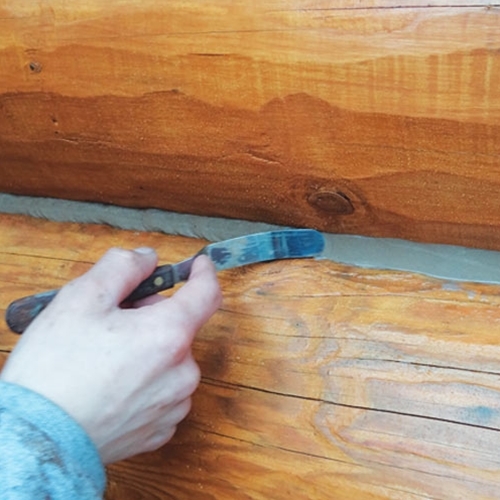 I decided to tackle sealing and refinishing my entire log home myself after getting quotes for over $30,000. It has taken months, but with a little work each week, it is nearly complete. Awesome company in my book!!!" Ernie on 2/27/2017 - "We used this on our wide gaps between our square logs. It is, simply stated, awesome!!!! Easy to work with once we got the backer all cut (one piece at a time, took forever) and really, no learning curve. Gives a very authentic appearance like we were trying to achieve!" Anna on 2/20/2017 - "We used Perma-Chink in the Tan color between our logs and I have to admit it looks really good. It is still very soft (just applied it a few days ago), but it says it takes a few weeks to cure. So far so good!" Tina on 2/17/2017 - "We used the Stone Perma-Chink to chink our log home, and it looks just like mortar, which is exactly the look we were after. Very happy customers!" Jim on 2/14/2017 - "I used Perma-Chink and backer rod to fill in quarter inch and half inch gaps between my logs and my stone chimney. It worked great and was easy to use! Five Stars"
Barry on 2/9/2017 - "This synthetic mortar chinking was recommended by our manufacturer and it seems to work pretty well so far....time will tell if it holds up." Nina on 2/8/2017 - "While researching Log Home Chinking, Perma-Chink kept coming up. We ordered a catalog and received a whole packet of information that included a brochure that explained our upcoming journey perfectly. We ordered the chinking, bulk loading gun, follow plate, and backer rod, and with the help of the on-line videos and an on-line chat with the company (Amie was very helpful!!) we were able to accomplish this task. Great chinking product as well as the technical back-up for us as well. We're very satisfied customers!! " Bryce on 1/31/2017 - "We used this on a 1880's log cabin that used to belong to my great great grandparents, and it looks just like mortar does. Perfect match to the period we were trying to get the look for. Easy to apply and clean up, and the stone is the perfect color. Really nice log home chinking, we're very happy!" Larry on 1/28/2017 - "I bought a log cabin made of 6x16 logs and mortar chinking. I would have preferred it had perma chink in the first place, but when the logs dried out enough to show gaps in the chinking I used perma chink and backer rod to fill them. Already have 2 winters and summers on it and it still looks great. Planning on continuing to the inside this year. Thanks!" David on 1/28/2017 - "We used the Stone colored Perma-Chink on the interior of our house a few winters ago and are very pleased with how it completes the inside look of our home. We heat with a gas fireplace and wood stove and the chinking has reduced our heating costs by sealing around the doors, windows, and especially along the purlin logs and the tongue-and-grove ceiling." Joyce on 1/28/2017 - "I purchased an Appalachian style log cabin with deteriorating exterior chinking that had never been applied properly. Because of the amazing help that I received from this company, I've begun the process of replacing the chinking with tan Permachink. I am using the 5 gallon pails, the follow plate, the bulk loading gun, and other items that were recommended. It is holding up beautifully. They were such a help to me and very encouraging and patient! After a couple of years, the first section has remained in perfect condition! I am so thankful that I took their advice on paying attention to the details!" S Wright in WA (01/25/17) - "SHORT & SWEET!!! I am reminded of the phrase---"How do you eat an elephant?" Simple---one bite at a time. My family and I built our log home and I was dreading the chinking process. No matter how much I sat and looked at the overall task---it simply seemed overwhelming, until I applied the "One bite at a time" technique, only in my case (one course of logs at a time). By breaking into small or SHORT sections I have been able to get ahead of the task and will complete at my leisure. The SWEET part is your product is superior and a pleasure to work with. Being water soluble makes it very easy to clean up. Can't get any better than that. Thanks Perma-Chink." S Crose in KY (01/05/17) - "My husband and I are in the process of building and restoring a 1800's log home. We chose PermaChink for our logs. There is definitely a learning curve when it comes to applying this stuff, we taped off our logs to achieve a cleaner line, we used duck tape because it stuck better than painters tape. We wouldnt leave it on too long though - the chinking was applied over top a silver insulated backing material my husband purchased from our local big hardware store. I would recommend you purchase the large application gun for those tight spots. If I had it to do over again I would have chosen a different color besides sandstone, it has a tendancy to appear pinkish in certain lights. It takes a loooong time for the permachink to fully dry, we applied ours in August and it was still tacky 4 days later. The rep told us it would eventually dry even in super cold weather. Be careful not to put the stuff on too thick or in to wide gaps, because it will fall off, we have super wide gaps 6" in some logs and we had to apply thin coats over several days to keep it from drooping off. It also shrinks so be sure to smoosh it in good. I believe this is the best product on the market, but be sure to experiment with your colors and watch lots of tutorials. " Jo at Premier Painters, LLC in ID (10/23/15) - "We have been applying Perma-Chink chinking material for over 13 years on a commercial level. Its performance is outstanding. Its ease of application and cleanup when used properly makes it a great product to use. It is virtually maintenance free when cured. When applied correctly to close air leaks your cost is quickly recouped by stopping energy loss. We highly recommend this Perma-Chink product!" B Fey in WA (06/15/15) - "I first used Perma-Chink chinking on my log home 18 years ago and it’s still holding up great. I recently added an addition and needed more so I thought I would place the order online, it was easy and the shipping was way faster than I expected, pleased with my purchase!" J Wilmes in TX (03/12/15) - "Perma-Chink is easy to apply and tool, and it looks great." S Foster in PA (10/20/14) - "Perma-Chink is a great product, and it lasts forever!" D Stevens in CO (09/13/14) - "Perma-Chink is great for sealing gaps between the logs to eliminate heat loss. Here in Colorado it can get quite cold! The Perma-Chink was relatively easy to apply and dried fast and was easy to clean up." K Wright in NC (08/12/2014) - "We restored a hundred year plus cabin that has been in our family for generations. It was a lot of work but the results were worth it. Replacing all that mortar with Perma-Chink was the right decision. We couldn't be happier with the products and customer service we got from you folks there." Jeff C in WI (06/30/14) - "Perma-Chink is an easy to apply and work sealer that gives the look of old mortar. I love that it is even easier to clean up...just soap and water! Great product and great colors!. P Augustine in AK (04/12/2012) - "We love our Permachink! The color is perfect to accent our stain and topcoat, the texture matches my grandparents' cabins' mortar (which was very important to me!) and it was easy to apply. WIN, WIN, WIN!!!" 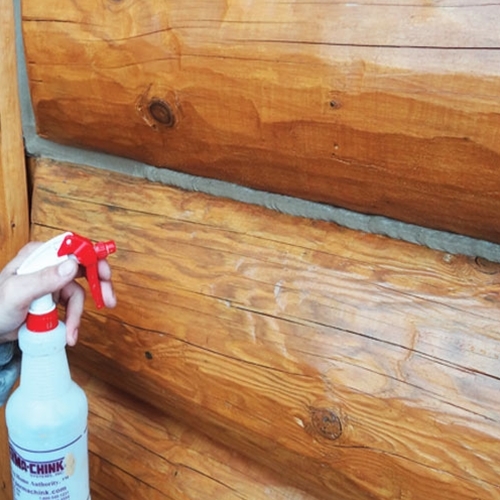 F Wohl in ME (09/12/2011) - "We used Perma-Chink on our log home and I cannot believe the difference this has made with cutting down the drafts in my home especially in the winter months."